Tuesday, April 23rd: We are watching the weather for tomorrow Wednesday, April 24th. It is possible that we will close tomorrow due to thunderstorms that are forecast to persist throughout the day. Please check back in the morning for an update. We are in a very busy period of the year. It is highly recommended to purchase your tickets in advance of showing up. There is a possibility that we sell out. You will learn all about Austin and it’s rich history while enjoying an awesome view of the city from atop of a double decker bus. By hopping off and on the bus you can self-explore the downtown districts. 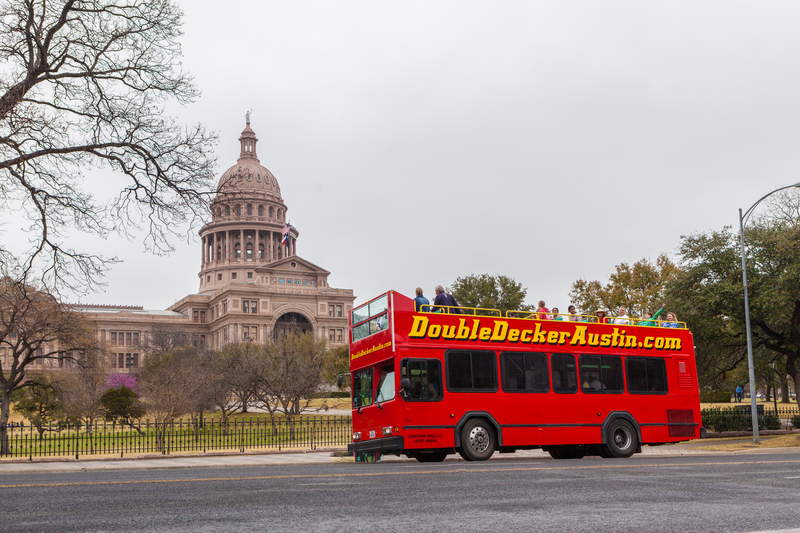 Why you should take Double Decker Austin for you Austin Experience? The best tour for taking photographs. People on the street love to interact with people on the upper deck. See and learn more about Austin by self-exploring Austin’s top attractions. Hop On Hop Off ticket is good for all day, spend the whole day really getting to know Austin. Hop off and enjoy lunch at one of Austin’s great restaurants, then get back on when the bus comes back around. Goes to more downtown attractions that any other Austin tour. Austin’s best tour guides solely focus on making your experience fun and interesting. They don’t have to worry about driving. Absolutely No Audio Recordings. We feel that you will enjoy your Austin experience much more by interacting with our guides instead of a listening to audio recordings.